Home » Posts tagged "Button Pull Test SOP"
Garments quality SOP is the standard operating procedure for quality control in Garments manufacturing. Setting Standard procedure for garments is very much important to get up to the mark of readymade garments. In a garments quality SOP, a clear description for every working system and requirement to get the best possible result is written. Following SOP, we can do any work in a standard way and know what to do to complete the whole operation. Garments buyer also gives SOP for handling their order. It is makers responsibility to follow while making their garments. 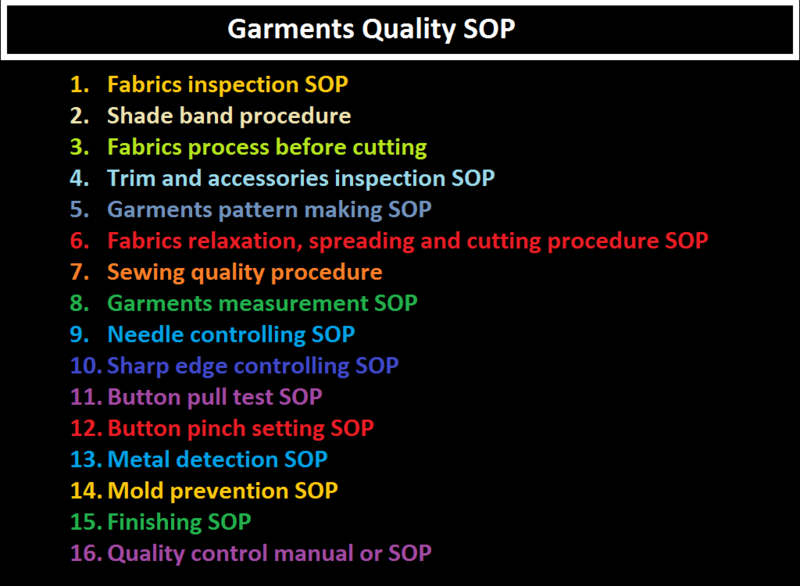 Every garments factory has own SOP for every process they are involved with. Basically, a garments quality SOP is the written guidelines of standard procedure to do a particular work for making garments. Time to time standard process may change because garments involve with making different garments different times. Actually, a good standard operating procedure increases productivity by reducing the system loss or operating losses. In a garments factory a quality control department is responsible for ensuring the best quality of garments, so they always follow a standard process for monitoring and controlling process and products. Listed SOP hyperlinked with needed SOP, you can read by clicking. If you need any SOP for a specific process/ task related with quality or you want to develop a quality manual or any technical thing of garments manufacturing, please feel free to contact with me through sending mail to the following address. Introduction of Button Pull Test: Button pulls test is used to determine the pulling strength of any type of button and snaps used in garments. It is also used to determine the holding or breaking strength of prong ring attached snap fasteners onto garments to ensure button fixed on the garments product properly. In this article, you will have an idea of button pull test SOP (Standard Operating Procedure) used in the apparel industry. Consists of an Upper Snap Clamp, a Lower Fabric Clamp, and Force Gauge mounted on a Stand. The snap component is gripped by the Upper Snap Clamp and the garment is fixed to the lower Fabric Clamp and by turning the Top Flywheel an operator can apply a specific force and the holding force. The breaking strength can be recorded. Pull test is mandatory for any types of garments product use button. Need to calibrate machine at least once in a week by supplier m/c calibrating tools. A specific template uses to calibrate machine to find out the accuracy of a machine by pulling that into a machine of known weight. For the pull test, you will always need to follow the buyer requirement pulling strength. If a buyer does not give any requirement, then you can follow your company’s own procedure. The Standard procedure is continued pulling 15 (second) in 93.4 /no. weight for all attaching components like button, rivet, eyelet, snap etc. If any item fails, then that should be removed from production and separated as a reject. Pull test should be done five pieces from each style 2 time every day and keep record and documents for every test.